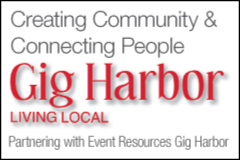 If you know about a location in or around Gig Harbor, Fox Island, Purdy, Key Peninsula or Port Orchard that would make a great place to hold events and it’s not listed on this site, we’d love to hear about it. The same goes for event services, vendors, entertainers and organizations that would make a good addition to our listings; use the form below to send us whatever details you can. Please tell us about the event location, service, entertainment or organization. If you can, include an address, contact phone number or email and any details that you'd like to share.